“… [Canadian] police can’t stop you from filming them, nor seize your phone, lawyer says – Public ‘absolutely allowed’ to film arrests, so long as they don’t obstruct police – By John Rieti, CBC News Posted: Jan 25, 2017– The man who captured video of Toronto police officers using a stun gun on a pinned suspect “absolutely” had the right to record that footage, a criminal lawyer says. Police are reviewing officers’ use of force and conduct in connection with the Tuesday morning altercation in downtown Toronto, which Waseem Khan shot on his mobile phone and shared with the media. Khan has since criticized police officers for threatening to seize his phone and warning him to stay back, telling him the suspect — who had been Tasered twice and was being held on the ground by multiple officers — was going to spit in his face and give him AIDS. Criminal lawyer Daniel Brown said he believes officers were trying to intimidate Khan, who had a legal right to record what was happening. “You are absolutely allowed to film police interactions with the public. It is part of our civic duties and responsibilities,” he told CBC Toronto, adding that more people should know their rights. , Installation, Media Arts, Music & Sound, Other, Performance, Photography, Printmaking, Sculpture, Visual Arts. Location: Yellowknife, Northwest Territories, Canada. Duration: 3 weeks. Programming begins mid-September to early October 2015 (flexible). Eligibility: Establishing and Professional Artists are welcome to apply. Costs / Support: There are no costs to the artist except for travel. The artist will be paid for their exhibition, workshop and/or artist talk(s) along with accommodations and a daily stipend. Although travel costs are not covered, YK ARCC will write a support letter for CCA travel grant upon request. Housing and artist studio are provided. Program Description: In Yellowknife, a city of approximately 20,000 inhabitants, homelessness is undeniably disproportionate and affordable housing options are limited. On the other hand, there is an abundance of unoccupied space in town. These spaces could be used in creative ways to display art and generate dialogue about how space is used in our town. Finding creative solutions is on our agenda. “This City III” is a project that falls in line with finding creative solutions to our city’s complex, intersectional needs. For its third year running “This City III” continues to address social concern and engage our community through the use of art. 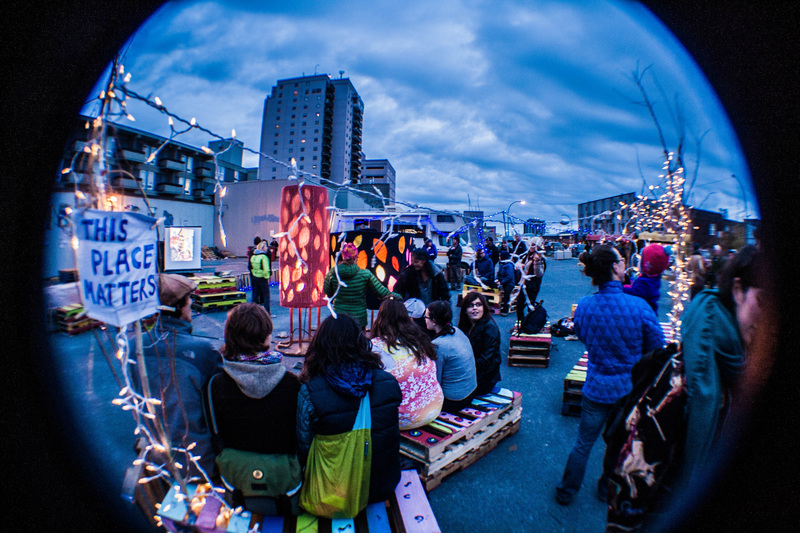 YK ARCC is looking for an artist to take to the streets and explore our city– our community, the locals, our local economies, our spaces, and create a project that offers findings, questions, and/or commentary relevant to our city. We ask that the project take place outside of the white box in order to further the opportunities for community engagement and reinforce the values of the project. Duties & Responsibilities: The artist is responsible for the research, development and completion of their own project in line with “This City III”, including: one measurable needs assessment, one artist talk, and one workshop (that lends itself to the project at hand) and finally one presentation of the work in form of exhibition/performance/installation/etc. Applications: Please send anything you find relevant to show your interest areas and previous works to: ykarcc [at] gmail.com. Make sure you include a short text explaining your motivation to come and work on this particular project. Optionally you can include a short description of a project you wish to realize here. CVs are not necessary but accepted. There is no fee to apply. A committee of local artists will look at applications on a rolling basis, so apply as soon as possible. BBC – Future – Technology – Reach inside your computer. New Adventures in Sound Art (NAISA) invites artists of all ages and nationalities to submit works on the theme SONIC GEOGRAPHY: exploring Space & Sound for consideration in New Adventures in Sound Art’s 2013 programming in Toronto, Canada. The NAISA Space is located in a 100 year old building originally constructed as a repair barns for the city’s streetcar trollies. The sound of these trollies over the past 100 years has become a signature of the Toronto soundscape. In recognizing this important local milestone NAISA is asking artists to consider sounds that speak of place and that help identify communities. Preference in programming will be given to works that respond in some way to the theme of SONIC GEOGRAPHY: exploring Space & Sound. Individual interpretations or variations on the theme are encouraged, but should be realized with sound as the primary component. NAISA would also like to encourage artists to submit works for performance, gallery exhibit, screening, webcast or audio stream, radio broadcast, network or translocal performance, mobile experiences and any other emerging formats that include sound as a primary element. Please complete in full the online submission form and upload your audio by midnight on November 15, 2012. Note: there is a $5 submission fee in order to defray the cost of processing the submissions. All works chosen for presentation will receive an artist fee.